عباس خلیلی, آزاده, خوشخو, ژاله, زارع گشتی, قربان. (1397). بررسی و مقایسه شاخص‌های شیمیایی و پروفایل اسیدهای آمینه ماهی قزل‌آلای رنگین کمان دودی شده به دو روش سرد و گرم. فصلنامه محیط زیست جانوری, 10(2), 205-210. آزاده عباس خلیلی; ژاله خوشخو; قربان زارع گشتی. "بررسی و مقایسه شاخص‌های شیمیایی و پروفایل اسیدهای آمینه ماهی قزل‌آلای رنگین کمان دودی شده به دو روش سرد و گرم". 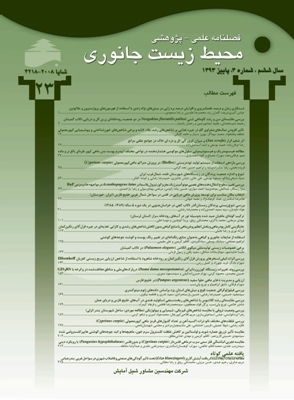 فصلنامه محیط زیست جانوری, 10, 2, 1397, 205-210. عباس خلیلی, آزاده, خوشخو, ژاله, زارع گشتی, قربان. (1397). 'بررسی و مقایسه شاخص‌های شیمیایی و پروفایل اسیدهای آمینه ماهی قزل‌آلای رنگین کمان دودی شده به دو روش سرد و گرم', فصلنامه محیط زیست جانوری, 10(2), pp. 205-210. عباس خلیلی, آزاده, خوشخو, ژاله, زارع گشتی, قربان. بررسی و مقایسه شاخص‌های شیمیایی و پروفایل اسیدهای آمینه ماهی قزل‌آلای رنگین کمان دودی شده به دو روش سرد و گرم. فصلنامه محیط زیست جانوری, 1397; 10(2): 205-210. امروزه روش‌های مختلفی جهت حفظ، نگه­ داری و بالا بردن زمان ماندگاری فرآورده‌های شیلاتی مورد استفاده قرار می‌گیرد و در تمام این روش‌ها تلاش می‌شود که ارزش غذایی محصول نهایی با کم ­ترین افت کیفی همراه گردد که از بین این روش ­ها دودی کردن صنعتی جایگاه ویژه‌ای در کشورهای پیشرفته دارد. در این تحقیق ماهی قزل‌آلای رنگین­ کمان دودی شده به دو روش دودی گرم صنعتی و سرد تهیه گردید. بدین منظور برای دودی گرم، ماهی پس از آماده ­سازی اولیه در دستگاه صنعتی Atmoos ابتدا در دمای ملایم (cه35) به­ مدت 30 دقیقه خشک گردیده و سپس به ­مدت 5 ساعت در دمای نهایی cه 800 دودی گردیده و در دودی سرد ابتدا از دمای cه 27 به ­مدت 30 دقیقه خشک گردیده و سپس به­ مدت 10 ساعت در دمای نهایی cه35 دودی گردید. تیمار‌های تولیدی به ­مدت یک ­ماه در دمای یخچال (cه 10±3) نگه­داری شد و از نظر تغییرات شیمیایی و پروفایل اسیدهای آمینه مورد بررسی قرار گرفتند. نتایج آنالیز آماری نشان داد که بین دو تیمار درنظر گرفته شده از نظر مقدار تیوباربیتوریک اسید (TBArs)، ازت فرار (TVB-N) و pH اختلاف معنی‌دار بوده است (0/05>P). از 14 اسید آمینه اندازه‌گیری شده در سه تیمار ماهی تازه به ­ترتیبب مربوط به اسیدآمینه گلوتامیک> لوسین > آسپارتیک> لیزین > آلانین > والین بوده و پس از دودی کردن به ­روش گرم و سرد کاهش معنی ­داری نداشته است (0/05<P) و در کل داده­ های بین ماهی تازه و دو تیمار دودی در مواردی تفاوت معنی ­دار بوده است (0/05>P) و در نتیجه گیری کلی تیمار دودی گرم در اولویت از لحاظ قابلیت مصرف و ارزش تغذیه‌ای قرار گرفته است. آمارنامه سازمان شیلات ایران. 1395. بشارتی، ن. و حسینی، س.، 1387. بررسی زمان ماندگاری ماهی سفید دودی شده به ­روش سنتی در یخچال و محیط طبیعی براساس شاخص شیمیایی TVB-N. مجله اولین کنفرانس ملی علوم شیلات و آبزیان ایران. لاهیجان. صفحات 1 تا 7. زارع­ گشتی، ق.، 1384. عمل ­آوری گوشت فیل­ ماهی و قره ­برون پرورشی و ارزیابی کیفیت صادراتی آن. انتشارات موسسه تحقیقات علوم شیلاتی کشور. 46 صفحه. کوچکیان، ا.، 1390. فناوری تولید فرآورده ­های شیلاتی. انتشارات مؤسسه آموزش عالی علمی کاربردی جهاد کشاورزی. AOAC. 2000. Official methods of analysis. 17th ed., Association of official analytical chemeists, Washington. DC. AOAC. 2015. Official methods of analyses of association of analytical chemist (15th ed). Washington, DC. Auburg, S.P., 1993: Review: interaction of malondialdehyde with biological molecules new trends about reactivity and significance.Int. J. Food Sci. Technol. Vol. 28, pp: 323-335. Arias, G., 2014. Effects of different thermal treatments and storage on the proximate composition and protein quality in canned tuna. Instituto de Ciencia y Tecnología de los Alimentos. 10 p.
Besharati, N.; Eyporsdottir, A. and Einarsson, H., 2004. Preliminary observations on nutritional and microbiological chages of hot and cold smoked trout (Oncorhynchus mykiss). The united nations university Training Programme. 51 p.
Bernardi, C.; Ripamonti, B.; Campagnoli, A.; Stella, S. and Cattaneo, P., 2009. Shelf-life of vacuum packed Alaskan, Scottish and Norwegian cold-smoked salmon available on the Italian market. International Journal of Food Science and Technology. Vol. 44, pp: 2538-2546. Cakli, S.; Kilinc, B.; Dincer, T. and Tolasa,S., 2006. Comparison of the shelf lifes of MAP and Vacuum packaged hot smoked rainbow trout (Onchoryncus mykiss). Euroup Food Research Technology. Vol. 224, pp: 19-26. Cardinal, M.; Gunnlaugsdottir, H.; Bjoernevik, M.; Ouisse, A.; Vallet, L.J. and Leroi, F., 2004. Sensory characteristics of cold smoked Atlantic salmon (Salmo salar) from European market and relationships with chemical, physical and microbiological measurements. Food Research International. Vol. 37, pp: 181-193. Dondero, M.; Cisternas, F.; Carvajal, L. and Simpson,R., 2004. Changes in quality of Vacuum packed cold smoked salmon (Salmo salar) as a function of storage temperature. FAO. 2010. The state of world fisheries and aquaculture 2008. ISSN: 1020-5489. Fahim Dezhban, Y., 2008. Processing of Fisheries Products. 1st Ed, Published by Mehronabi. 291 p.
Fagan, J.D. ; Gormley, T.R. and Mhuircheartaigh,M.M., 2004. Effect of Modified Atmosphere packaging with freeze chilling on some quality parameters of raw whiting, mackerel and salmon portions. Innovative Food Science and Emerging Technologies. Vol. 5, pp: 205-214. Gonza lez, S., 2006. Composition of farmed and wild yellow perch (Perca flavescens). Jornal of food composition and analysis. Vol. 19, pp: 6-7. Leroi, F.; Joffraud, J.J. and Chevalier, F., 2000b. Effect of salt and smoke on the microbiological quality of cold smoked salmon during storage at 5°C as estimated by factoial design method. J of Food Protection. Vol. 63, No. 9, pp: 1222-1227. Lannelongue, M.; Finne, G.; Hanna, M.O. ; Nickelson, R. and Vanderzandt, G.,1982. Storage characteristics ofbr own shrimp (Penaeus aztecus) stored in retail packages containing CO2 enriched atmospheres. Journal of Food Science. Vol. 47, pp: 911-913. Luiza, M., 2010. Effects of hot and cold smoking processes on organoleptic properties, Yield & composition of matrinxa fillet. Revista Brasileka de Zootecniq. Vol. 39, pp: 695-700. Ibrahim, S.M. ; Nassar, A.G. and El Badry, N., 2008. Effect of modified atmosphere packaging and vacuum packaging methods on Some Quality Aspects of smoked mullet (Mugil cephalus). Global Veterinaria. Vol. 2, No. 6, pp: 296-300. Matos, T.G.S. ; Barreto, A.S.F.H. and Bernardo, F.M.A., 2005. Effect of shelf life period in modified atmosphere package and of processing technology on microflora of Portuguese smoked dry sausages. Revista Portuguesa de zootecnia. Vol. 2, pp: 15-35. Oehlenschlager, J., 1981. Variation der gehelte an fluchtigen stickstofgehaltigen basen und TVB-N in Retbersch. Fischals Lebensm. Vol. 53, pp: 33-34. Ovissipou, M., 2011. Fatty acid and Amino Acid Profiles of Domestic and Wild Beluga (Huso huso) Roe and Impact on Fertilization Ratio. Journal of aquaculture research and evelopment. Vol. 10, pp: 2-3. Pantazi, D.; Papavergou, A.; Pournis, N.; Kontominas, M.G. and Savvaidis, I.N., 2008. Shelf-life of chilled fresh Mediterranean swordfish (Xiphias gladius) stored under various packaging conditions: Microbiological, biochemical and sensory attributes. Food Microbiol. Vol. 25, pp: 136-143. Silva, L.V.A. ; Prinyawiwatkul, W.; King, J.M. ; Kyoon No, H.; Bankston Jr, J.D. and Ge, B., 2008. Effect of preservatives on microbial safety and quality of smoked blue catfish (Ictalurus furcatus) steaks during room-temperature storage. Food Microbiology. Vol. 25, pp: 958-963. Stohr, V.; Joffraud, J.J.; Cardinal, M. and Leroi, F., 2001. Spoilage potential and sensory profile associated with bacteria isolated from cold smoked salmon. Food Research International. Vol. 34, pp: 797-806. Sivertsvik, M.; Jeksrud, W.K. and Rosnes, J.T., 2002. A review of modified atmosphere packaging of fish and fishery products-significance of microbial growth activities and safety International Jornal Food Science Technology. Vol. 37, pp: 107-127. Varlik, C.; Ugur, M.; Gökoglu, N. and Gün, H., 1993. Quality Control Methods and Principals for Aquaculture. Istanbul Society of Food Technology. Vol. 17, 98 p.
Woyewoda, A.D.; Shaw, S.J. ; Ke, P.J. and Burns, B.G., 1986. Measurement of pH. recommended laboratory methods for assessment of fish quality 1-5. Canadian Technical Report of Fisheries and Aquatic Sciences Fisheries and Oceans, Halifax, Nova Scotia. 1448 p.
Yanar, Y.; Celik, M. and Akamca, E., 2006. Effects of brine concentration on shelf-life of hot smoked tilapia (Oreochromis niloticus) stored at 4°C. Food Chemistry. Vol. 97, pp: 244-247. Yalcin, K., 2008. Fatty acid and amino acid composition of raw and hot smoked sturgeon (Huso huso). International J of Food Sciences and Nutrition. Vol. 59, pp: 635-642. Zhao, F.; Zhuang, P.; Song, C.; Shi, Z. and Zhang, L., 2010. Amino acid & fatty acid compositions & nutritional quality of the muscle in the pomfret, Pampus punctatissimus. Food Chemistry. Vol. 118, No. 2, pp: 224-227.